(L-R) Glyn, Roger, Ben, Peter, Ces in front. Glyn Conway, the stage name adopted by Glyn Tucker, was born in Auckland in 1945. He developed an interest in music at an early age. 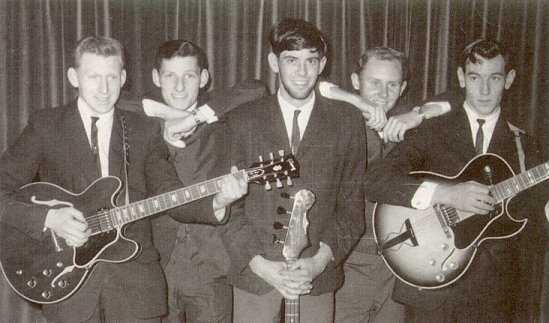 After having a stint with the Stereotones and Ian Lowe and the Tornadoes, he successfully auditioned for a band as a rhythm guitarist / vocalist in 1962. They were the Embers and he stayed with them until they folded in 1964. From there he landed a residency as compere / singer at the Papatoetoe Town Hall on Saturday nights. During this time he got back together with guitarist Paddy McAneney and drummer Roger Wiles, who he had dabbled with earlier, and they added Peter Davies on guitar and Ben Grubb on bass and called themselves the Adventurers. 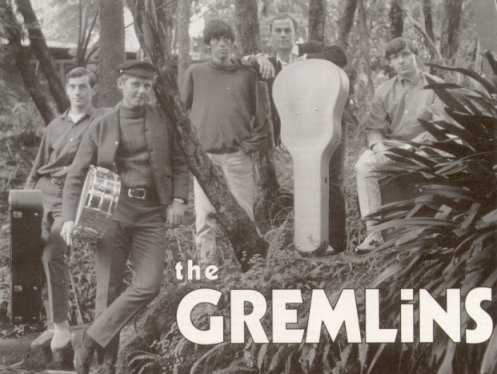 In 1965 they changed their name to the Gremlins. Their first recording was made in late 1965 and consisted of two Glyn Conway originals. The single released on Allied International was "Don't Ya"/"But She's Gone". It disappeared without a trace quite quickly as there was quite a number of local recordings being released around the same time. They continued to gig around the Auckland suburbs while trying to get a foot into the highly competitive city scene. In early 1966, Glyn meet up again with Gary Daverne, whom he had played with during his days with the Embers. Gary, who had also played with Red Hewitt and the Buccaneers, had started a subsidiary label, Viscount, distributed through Eldred Stebbing's Zodiac label. The Gremlins auditioned for Gary and he got them a recording session at Stebbing's studio. During the session they recorded the following songs, "Coming Generation", "That's What I Want", "Only Thing On My Mind", "Oh My Word", "It's Easy To Say" and "A Man's Gotta Be A Man". The boys believed that "Coming Generation" should be released as a single, but Gary deemed that it sounded lacklustre. The song had originally been the B-side of the US group, the Knickerbockers's classic hit single "Lies". Still believing they could make a hit of it, they re-entered the studio and re-recorded the version that was released in September 1966. The single on Viscount was "Coming Generation"/"That's What I Want" and was an instant hit, climbing to number 2 on the national charts. It should have made it to number 1, but was held out by the Beatles' "Yellow Submarine". 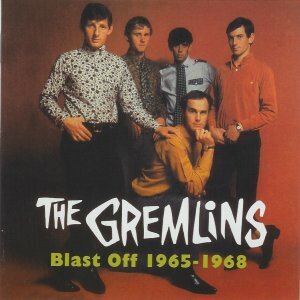 The song was played heavily on the radio and the Gremlins performed it on the TV show "C'Mon". The song was also entered in the 1966 Golden Disc Award and made it to the finals. They didn't win, but as a result found themselves touring the country as part of the Golden Disk show. 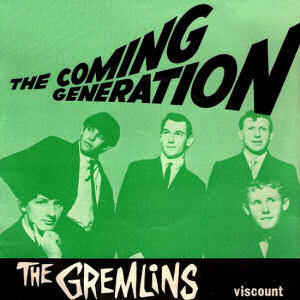 Before the end of 1966 an EP called "The Coming Generation" was released. It contained the title song and the rest of the songs recorded from the first session at the Stebbing studios. As is generally the case, following up a massive hit with something as good is never easy. The next single was "Understand Our Age"/"Ain't That Loving You Baby". The single went nowhere. The B-side was in fact an excellent cover of the Elvis hit. At the beginning of 1967, Paddy McAneney left the group. This resulted in a reshuffle within the band. Ben Grubb moved to organ, Peter moved to lead guitar, Glyn played 12-string rhythm guitar, Roger stayed on drums, and a new bass player by the name of Ces Good was recruited. With this line-up, a new single, "You Gotta Believe It"/"I Can't Say" was released in April 1967. The single reached number 19 on the national charts and was the last time the group featured on the charts. 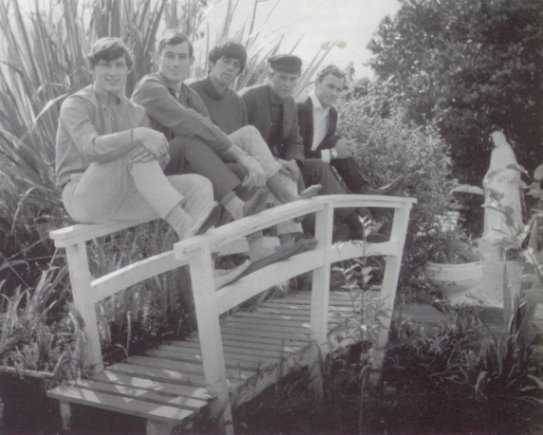 Early 1967 (L-R) Peter, Roger, Ben, Ces and Glyn. The group then turned their attentions to the up-coming Golden Disc Awards for 1967. A new song was written for the event, called "Blast Off 1970". It was backed with "Sunday Breeze". Again they toured with the Golden Disc Spectacular and again they missed out on a prize at the awards. After the gruelling touring schedule, the group only gigged occasionally through to the end of 1967. Early 1967 (L-R) Glyn, Peter, Ben, Roger and Ces. A new single at the beginning of 1968 gave them new enthusiasm. It was "Never You Mind"/"I Want Your Love". It was a great single, but unfortunately again went nowhere. It was very frustrating for the boys, when you produce great music, but get ignored by the public who seemed to prefer the syrupy sounds going around at the time. Further line-up changes occurred with Peter Davies leaving and being replaced by Daron Curtiss on lead guitar. Daron had previously been with Gisbourne group, the Crying Shame, not the Auckland version. Another single, this time on the Zodiac label, was released. It contained two songs on the A-side, "Ballad Of A Busker" and "Listen To Me". The flipside label showed "Zodiyuk Wecords" and the song "The Great Drain Robbery" was credited to the Germlins. The format of the record confused radio programmers and the result was another flop. 1968 (L-R) Roger, Daron, Ben, Ces and Glyn. 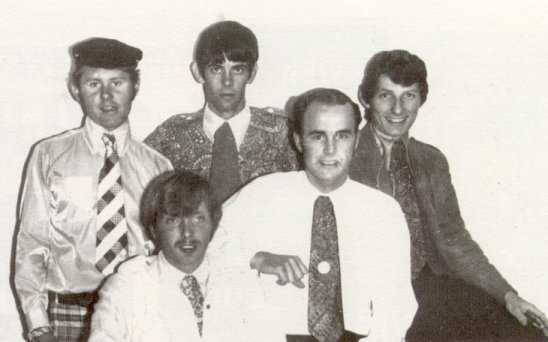 The group decided to give it one more go and released their final single called "Kingsforth Hemmingseen"/"Don't Just Stand There" late in 1968. As good as their songs were, the record buying public didn't want to know. With all hopes dashed, the Gremlins disbanded at the beginning of 1969. Glyn returned to his real name and along with Gary Daverne and former Breakaway, Dave Hurley, became partners in a new recording studio called Mandrill. This studio became one of the most successful in New Zealand during the eighties. In 2004 EMI released a CD called "Blast Off", which contains all of their singles.